Nigeria recently held both presidential and gubernatorial elections in the span of a few weeks. While the results were broadly credible, the process was replete with logistical failures and delays, misconduct, voting irregularities, and violence that resulted in the deaths of at least 58 people since the presidential elections began, and approximately 600 people since the start of campaigning in November 2018. Authorities and civil society groups are now seeking to determine how to hold individuals accountable for any misconduct—questions which have significant bearing on Nigeria’s democracy in the coming years. How Credible Were the Elections? Civil society and international observers agree that the results of the presidential election were broadly credible. Incumbent president Muhammadu Buhari of the All People’s Congress (APC) won 55.6 percent and Atiku Abubakar of the People’s Democratic Party (PDP) won 41.2 percent of the vote. YIAGA AFRICA—a civil society group leading the Watching the Vote Campaign—conducted a robust parallel vote tabulation exercise, and confirmed shortly after results were announced that the figures fell within their estimated ranges. However, observers also expressed serious concerns about the electoral process, and called on the Independent National Electoral Commission (INEC) to investigate “systemic failures.” Among these challenges were extraordinarily high rates of cancelled ballots, which disenfranchised nearly 3 million Nigerians. The number of these ballots was four times higher than in 2015, raising concerns that vote cancellations may have been part of deliberate efforts to manipulate election results. 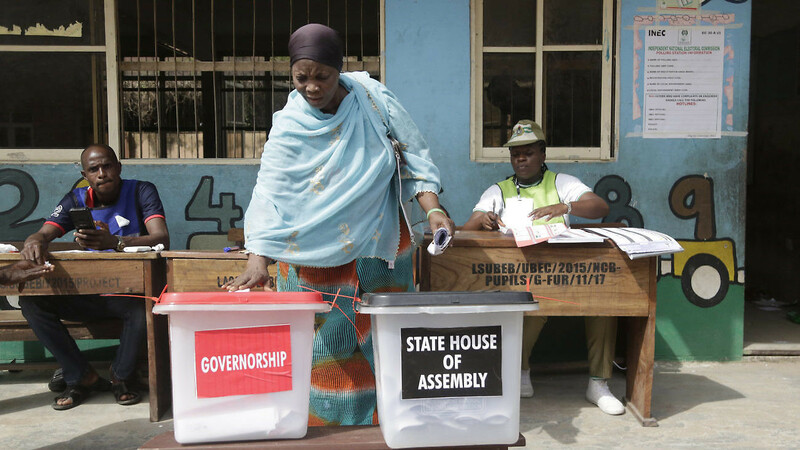 Two weeks later, Nigeria’s governorship elections experienced violence that led to at least 17 deaths as well as interference by political actors and security agents. In seven states, INEC declared the election inconclusive because the number of cancelled votes was higher than the leading candidate’s margin of victory. In the state of Rivers, for example, military personnel blocked European Union and Nigerian civil society observers from entering collation centers. The military reportedly harassed INEC officials, and prevented election observers from observing the collation process. Civil society observers reported the hijacking of election materials, and incidents of abduction, assault, and harassment of election officials by persons in military uniform. By some estimates, the 2019 elections had the lowest voter turnout since the country emerged from military rule in 1999—and the lowest on the continent. While voter turnout could have been influenced by many factors, some have speculated Nigerians may be losing faith in the freedom and fairness of the process. The stakes of the presidential elections in 2023 may be higher than they were this year, due to an unwritten “zoning agreement” among the political elite that ensures northern and southern presidents alternate power every two four-year terms. In 2023, the presidency will shift to the south. The extent of the misconduct and security sector interference witnessed during governorship elections states demonstrates an urgent need to change the calculus for political actors and their supporters. One way could be by demonstrating that electoral offenses carry consequences. Civil society has called for individual legal accountability for electoral offenses, which they believe could restore some credibility to Nigerian elections and deter electoral offenders in future elections. “Electoral malfeasance will persist if no perpetrator is brought to justice,” said YIAGA AFRICA. The challenge of ensuring accountability is that there is a vast and complicated network of actors involved in electoral misconduct, and a disproportionate focus on these who carry out violence vis-à-vis those who orchestrate it. Nigerian civil society has placed blame on the country’s political elites for orchestrating the worst examples of electoral misconduct, and criticized the government for allowing them to operate with impunity. However, the vast majority of arrests in 2019 have been the perpetrators of violence and misconduct—so-called “political thugs” paid by political elites to disrupt or influence voting. If accountability processes intend to deter future misconduct, political elites must also be identified and investigated—an unlikely outcome in Nigeria, where elites have a history of operating above the law. The majority of arrests after the presidential elections were of low-level operatives rather than political elites. Individual accountability for those who carry out violence on behalf of political actors may raise potential costs for engaging in misconduct, but allegations of misconduct or violence require credible investigation and prosecution. This will pose a challenge for Nigeria’s overburdened and under-resourced justice system. The Nigerian Police Force will require adequate staffing and resources to investigate electoral offense cases. The Special Elections Investigations Team (SEIT), based in Abuja, was set up to investigate electoral offenses, but it currently unclear where investigations funding will come from. Of the approximately $84 million given to the Nigeria Police for election security, no money was set aside electoral offense investigations, according to sources close to INEC. To properly investigate electoral offense cases, SEIT will need to travel to states to gather evidence and interview witnesses to build cases that will stand up to judicial scrutiny. Without proper investigations, cases are likely to languish in the court system for long periods of time, or collapse due to lack of evidence, which may fuel perceptions that electoral offenses tend to go unpunished. These outcomes could also deepen public perceptions that arrests have been partisan. Prior to the elections, pending legislation that would establish an electoral offenses commission and an electoral offenses tribunal to specifically hear election-related cases was not passed. In theory, a separate tribunal could allow electoral offenses to be dealt with quickly, rather than getting stuck in Nigeria’s overburdened courts. Another important consideration is the accountability of those in the security sector. Unarmed security agents and police mostly conducted themselves with restraint, according to observers from the National Democratic Institute and CLEEN Foundation, a Nigerian civil society organization that deployed thousands of observers to monitor the conduct of security personnel during the elections. However, CLEEN Foundation and international observers reported personnel in military uniform engaged in sporadic shooting and killings, voter and observer intimidation, and theft of electoral materials. Holding individual security agents responsible for misconduct presents its own challenges. The police are legally the lead agency in providing election security and there are clearer processes available to hold them accountable. Complaints against police are filed with the Police Services Commission (PSC), an external civilian oversight body for the Nigeria Police Force. The PSC is currently investigating reports of police officers aiding vote buying, and turning a blind eye to ballot box snatching in several states, according to Rommy Mom, Human Rights Commissioner for the PSC. “We will be releasing a report on what we found and what we did to address specific incidences and specific officers,” he said. However, the military appears to have been involved in the most brazen examples of security sector misconduct. When reports emerged of men in military uniform blocking observers and aiding electoral interference, the Nigerian Army denied any involvement, claiming that politicians were providing people with military uniforms to confuse the public. Later, on March 15, the army announced the creation of a nine-member committee mandated to investigate the activities of army personnel in all states accused of electoral misconduct, and to interact with civil society, other security agencies, and state governments regarding any allegations. It is unclear the extent to which the army will be able to take meaningful steps to investigate and punish officers. Civil society has also speculated that the army may have been acting on behalf of political actors. The stakes of getting election accountability right are high. If these processes fail, the credibility of Nigeria’s democracy could be undermined, possibly contributing to a more volatile political security environment through to the 2023 elections. The governorship elections in particular exposed cracks in Nigeria’s electoral democracy that will need to be addressed to restore faith in the process, and steps must be taken to prevent these issues from re-emerging in 2023. The violence and misconduct witnessed during the 2019 general elections exposed the stakes of maintaining power, and the political shift from north to south in the 2023 elections will likely bring additional challenges as new networks and centers of power emerge. Nigeria’s civil society groups set the groundwork for ensuring electoral accountability by deploying thousands of observers across the country to observe and report on the conduct of the 2019 general elections. Now, it is up to the government to investigate and hold individuals accountable for loss of life, voter disenfranchisement, and efforts to manipulate election results. For Nigerian voters, the accessibility and fairness of the process may be as important as the credibility of the results. Violence, intimidation, and harassment increases fears around voting, and evidence of misconduct that goes unpunished may lead citizens to decide that voting is more trouble than it’s worth. Claire Wilmot is a freelance writer and a research officer at the University of Toronto’s Global Justice Lab. She tweets @claireLwilmot.